... Emma tells Will that she's seeing someone else: her dentist. But Will later responds to this with three words that will hopefully play a major role on season two: I love you. ... despite the presence of Sue as a judge, and the lack of hope surrounding their chances, the group heads to Regionals. There, they sing a Journey melody and appear to steal the show. However, celebrity judges Josh Groban and Olivia Newton-John aren't fans of New Directions. Or of Sue. 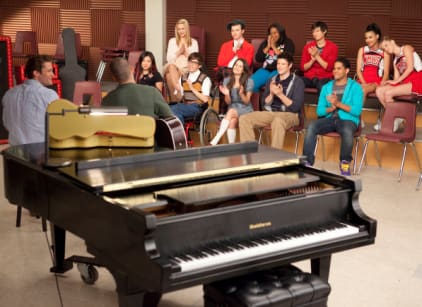 Newton-John especially puts Sue down as a wannabe celebrity, and makes reasonable connections between her and the choir she hates. This leads to Vocal Adrenaline winning the title and New Directions coming in third out of three teams. Based on the deal with Figgins, this means the choir is finished - but wait! Sue convinces Figgins to give the group one more years because she feels badly for the kids. This leads to a nice moment between Sue and Will, even if the former threatens to "throw up" on him if it goes on too long. ... Quinn gives birth to a daughter. She gives it up for adoption... to Shelby! Time will tell if we see more of Rachel's mother next season as a result. And, with that, the season came to an end, as the group sang an emotional song to Will to thank him for all he did for them. It was a great episode and you can read more about it via my review.